We are nearly at the end of Best Lane. 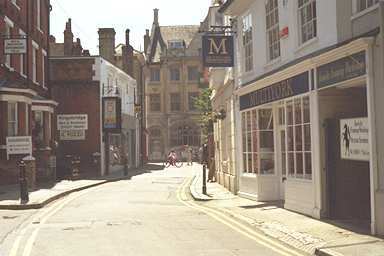 Ahead is Canterbury's main post office. Turn round for a good view. Alternatively, you can see a report about the Canterbury Archaeological Trust's findings at a building that is on the right in the photo. It's now a furniture sales room. Just on this side of the archway, and is Gordon Larkin's shop, he's an interior designer and can sort you out with good quality wallpaper and the like.